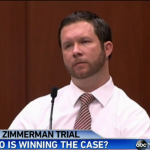 Dan appeared on World News with Diane Sawyer last night to discuss at what stage the Zimmerman Jury jury is at in the Zimmerman Trial. For weeks, the jurors were watched as they took notes furiously, but now that is tapering down and they are even declining breaks. Analysts speculate that their apparent hurried to get through this, might mean that they’ve made up their minds already. Dan says, “The testimony of the neighbor and eye witness, John Good. He had the best advantage point, he had the clearest testimony about exactly what happened during that altercation. Because no matter who started this incident, if George Zimmerman was on the bottom and getting pummeled, he can argue self defense and the prosecution has to disprove it beyond a reasonable doubt. You could make the argument that John Good, in conjunction with the injuries that George Zimmerman had is reasonable doubt.” Watch the segment here.